Barinder Saluja, Chandigarh, March 08 :- Chandigarh is all set for 2nd Chandigarh Marathon, a mega tourism sports event of Chandigarh Administration scheduled to be held on March 13, 2011 from Rock Garden to Chandigarh Golf Course and back. A Press Conference regarding the 2nd Chandigarh Marathon was held today under the chairmanship of UT Finance Secretary Mr. V.K.Singh, Home Secretary, Mr. Ram Niwas, Director of Tourism, Ms. Amandeep Kaur, Director of Sports Mr. Rahul Gupta, Mr. S.K.Birla, DGM, State Bank of Patiala. It was disclosed in the Press Conference that a T-shirt will be given to every participant. Along with it the Marathon will give every single participant an opportunity to feel like a winner. The Marathon is being organized in the Full Marathon (42.197kms), Half Marathon (21.095) and Dream Run (5kms). Arrangements for refreshments during the run and at the finish point are being made. Mr. Niwas also said that the event has received great response at local, national & international level. The flag off ceremony for Full Marathon will be done by Olympic and World Championship bronze medalist Vijender Singh, the Half Marathon will be flagged off by renowned golfer Jeev Milkha Singh. Besides this, the brightest star among a new breed of talented Indian Shooters, Abhinav Bindra would join the dream run. The prize money amounting up to Rs Six lacs will be awarded to the winners in different categories, in which 1st will get One Lac; 2nd will get 75 thousand; & 3rd will get 50 thousand rupees. Finance Secretary, Mr. V.K. Singh said that Chandigarh with its scenic beauty, broad flat roads and sporty culture will make the 2nd Chandigarh Marathon the best organized event in the country. He also added that various teams have been deputed by the Health Department for thorough examination of the participants and also to take care of athletes during the event. Ambulances will be deployed on the Marathon Route to avoid any untoward incident. The Route map of the Marathon has already been finalized in consultation with the officials of Sports Department and Chandigarh Police. All technical support for the smooth conducting of the Chandigarh Marathon will be given by the Sports Department. To create a sense of involvement and participation of Chandigarhians and the residents of tricity for the 2nd Chandigarh Marathon, pre Marathon run was also held today at 6 pm from Rock Garden. Chandigarh ‘s running community, sports loving populace , health and fitness enthusiasts and athletes were in line to provide a ringside view of some of the racing track of Chandigarh Marathon in a Boulevard road from Rock Garden towards Sukhna Lake promenade .The athlete runners led the pre Marathon run with Mashaals to give a truly extraordinary glimpse of the 2nd Chandigarh Marathon scheduled in the morning hours of Sunday on 13th March, 2011. Shri Ram Niwas, Home Secretary Chandigarh along with Sh.V.K Singh Finance Secretary UT, Director Sports and other officers of Chandigarh Administration participated in the Pre Marathon run along with Dinesh Mongia . The representatives of State Bank of Patiala (Principal Sponsor) and Indian Oil Corporation (CO Sponsor)of Chandigarh marathon also participated in the event. The special feature of the event will be a world class Marathon expo to be held on 11th March at Cricket Stadium Sector 16 where runners will get great information on different aspects of running and staying injury free, will get bibs, T-Shirts for registered participants in 2nd Chandigarh Marathon runs. 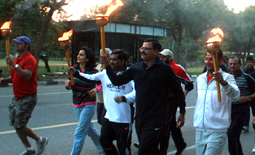 The last date for the registration for 2nd Chandigarh Marathon is March 11, 2011. It can be done online by visiting www.chandigarhmarathone.com.